British police in York, England are on the lookout for a suspect that they believe is a white woman. Or a green woman. Or a white woman in green paint. Whatever. 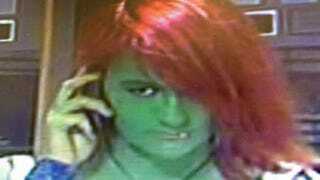 Not to be confused with the other recent Hulk attack, this alleged Hulk assault happened in late April outside a McDonald's at 3am and left a 17 year-old young woman with a bruised face and a black eye. According to The York Press (via Bleeding Cool), police now think that a woman covered in green body paint and dyed red hair carried out this "wholly unprovoked assault". The victim's injuries, thankfully, were not as severe as they could have been. The alleged attacker appears to be in her late teens to early twenties, around 5ft 8in tall, and seemingly prone to dress as Marvel characters. Police Constable Cheryl Hunter told The York Press, "If you witnessed the assault or can identify the woman I need to speak to about this incident, I ask that you contact the police or Crimestoppers straight away." Word of caution: Just don't make this suspect angry. You wouldn't like her when she's angry.